Call 604-448-2333 for a free estimate! With property values high and interest rates low, there’s never been a better time to renovate your home. The key is choosing a company with a solid reputation who can deliver on their promises. We are Bloom Construction. Let Bloom Construction help you plan and budget for the renovation that will help you make the most of your home. Whether it’s a kitchen revamp, a new bathroom, a basement makeover, a new deck or an income-producing suite, Bloom can handle it all. An experienced production manager is assigned to each and every project from beginning to end, regardless of scope or budget. Our One-Stop Renovation Process means you get all the info and expertise you need from one company. 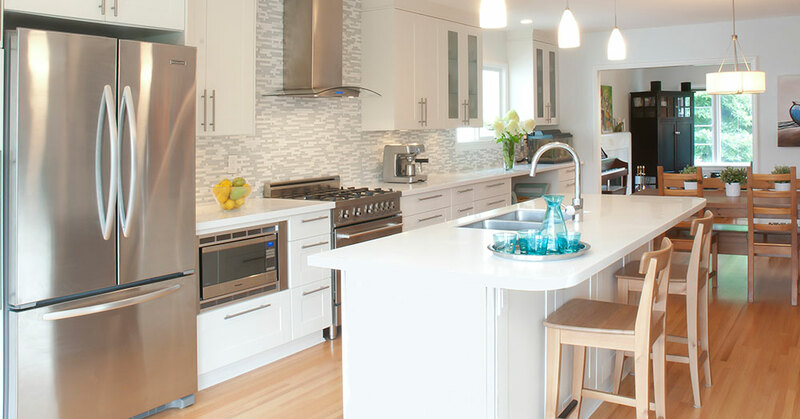 Read more about what makes us stand out among General Contractors and Renovation Companies in Vancouver BC. We retained Gord and his team to do a full renovation of our home. His team was efficient and on time in delivering value for our money. His site supervisor was excellent and worked hard to ensure our money was well managed. Overall, we were very happy with the work undertaken. When there were issues, Gord and his team were quick to resolve the issues to our satisfaction. Gordon Lebel and his team at Bloom Construction do great work. I first contracted Bloom Construction in 2013 to perform some repair and renovation work, and because I was highly satisfied with the quality of the work done, I have since then contracted Bloom Construction in 2014 and in 2015 to perform additional work. Gordon Lebel is a very experienced and skilled contractor that can tackle any job. He listens carefully to my requests and is able to problem-solve through various situations that he encounters. The end result is a very happy client. I highly recommend Bloom Construction. We have sincerely appreciated working with Gord Lebel and the people at Bloom Construction. We have hired them for two separate substantial projects including a bathroom, kitchen and deck. Gord delivers on what he says he will do, he has an eye for detail, does quality work, and is trustworthy. I have recommended him to friends many times over. Thanks. Bloom Construction is excellent: honest, reliable, experienced, knowledgeable, hard-working, and responsible. Bloom has completed several successful renovation projects for me. They know the best quality materials to use and do not cut corners. I was delighted when they were also able to successfully fix a serious roofing/ceiling leak that at least three other contractors could not. Good luck with it all. We have hired Bloom Construction on two occasions. Most recently we had Gordon rebuild and relocate a master walk-in closet including constructing an alcove for the stacked W/D accessed from the master bedroom. We are very pleased with the results. The project was completed on short notice, on time and on budget. The quality of the work was excellent. We are happy to give Gordon and Bloom Construction a strong recommendation. The work they did for us was really very good. The standard of finish was first class. Your workers were efficient and considerate and they were very careful of their surroundings. We would not hesitate using your company in the future. We recently had Bloom Construction design and renovate our master bathroom, along with replacing all the windows and doors including front entry unit of our home. We were extremely pleased with all their design ideas, quality of the workmanship and products. In the past we had them design and build custom cabinetry units for our family room, as well as some interior finishing and new hardwood flooring. All of Bloom’s work was a seamless process with our expectations always met. We have and will continue to recommend Bloom Construction. When I needed someone I could trust to work out why I had problems with my siding I turned to Gordon because he not only gets to the root of any problem but provides different ways to fix it. His work is superb, guaranteed and even better – he cleans up every day! Reno’s are no fun but Gordon makes them less stressful than anyone I have worked with. Gordon rebuilt our aging deck seven years ago. He proved himself to be honest, capable, precise (hardly a foot of wood went to waste) and dogged at getting things right. We loved the result then and are still enjoying it now. We used Bloom Construction for a home renovation in 2012. We are very happy with the end result. The new layout and kitchen have been great for entertaining. We have received many compliments on the renovation. I would recommend Gordon at Bloom and his team to anyone.